Disney has so very many restaurants. There are the counter-service food places and then there are the sit-down dining experiences. We have done many of both. Too many to name. For the sake of this post I'm going to focus on the sit-down variety. Which, with young children, is something I really wouldn't recommend doing. Every restaurant is child-friendly and has a children's menu, etc. But I'm not the type to do well when there are fussy children who don't want to sit quietly. Particularly my own. No, I'm basically only talking about my own. I'm seeing a Buddhist about it. You may notice an addition to the above and that would be dear Laurie. 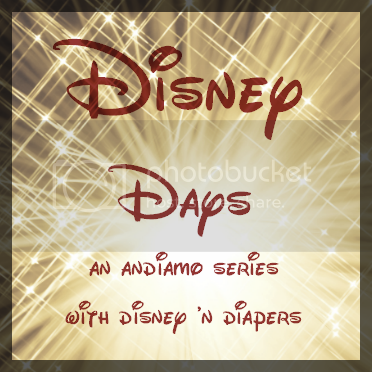 Of Disney n' Diapers. You should pop over and check out her Disney info as well. Because it's Disney. Back to the food! My initial thought is to list pretty much every restaurant in Epcot. Because, simply put, they have the best restaurants. We've eaten in Italy, China, Mexico and England. Can't complain about any of them. The Rose & Crown in England overlooks the big lake and I hear if you get reservations close to fireworks time it's the best view in the whole wide park. The San Angel Inn inside the Mexican pavilion in Epcot has a really great atmosphere. Just not for children. The ceiling looks like a star lit sky (you just can't tell from this picture). It's loud. It's dark. It's crowded. And apparently difficult to photograph. Mama Melrose's Ristorante Italiano in Hollywood Studios. The food is banging and the atmosphere is fun and loud and just how I like it. Look at all the twinkle lights! There really isn't much to choose from as far as sit-down dining goes in this park, but this one is a hit. The Maya Grill in Coronado Springs Resort. This was Mexican fare obviously and it was such a favorite that we ate there even a time when we were not staying in the resort. This photo has nothing to do with the price of tea in China other than we were on our way to eat at that restaurant. Coral Reef Restaurant in Epcot. Have I mentioned the atmosphere in these places? You sit in booths that face a giant aquarium. So there is a lot to see. It's especially exciting when they clean the tanks during your lunch. And they had a cute Christmas tree up. There really are too many to go through so this was just a taste. See what I did there? Ha. This year we tried to stick to restaurants we hadn't eaten at yet. Why yes you can book your dining reservations months in advance and yes, we have done so. We are nothing if not thorough. What are your favorite places to dine? not just any Buddhist. His Holiness... the Dalai Lama. I was literally just scrolling down to write that lol. We never seem to do sit down restaurants INSIDE the parks, we usually stick to the hotels... but now I'm dying to try some of the Epcot restaurants! My favorites are the Cape May dinner buffet at the Beach Club and O'Hana at the Polynesian! Love eating at Epcot, it is the best! We enjoy Germany's Biergarten. But, the San Angel is my fave. My husband's all time fave is Ohana. It's fun to try new places. So you love Mama's at HS? Good to know!! I've been debating trying that a few times.. maybe next week I'll put out a list of my favs? I thought the rose and crown was over rated, the fish everyone raves about? My husband said it tasted like funnel cake batter:( We had an AMAZING view though over looking the lake on the lower patio! I personally love the restaurants at HS..50's prime time is one of our favorites! Great article. Thank you for this article. This restaurant is very well furnished. My favorite restaurant is san Antonio restaurant. There food is very tasteful and fresh.